Michael Vick Returned To NFL After Prison; Plaxico Burress Next? : The Two-Way As Vick proved, there can be life again in the NFL after time in prison. But Burress is older and he's a wide receiver — not a star quarterback. Michael Vick Returned To NFL After Prison; Plaxico Burress Next? 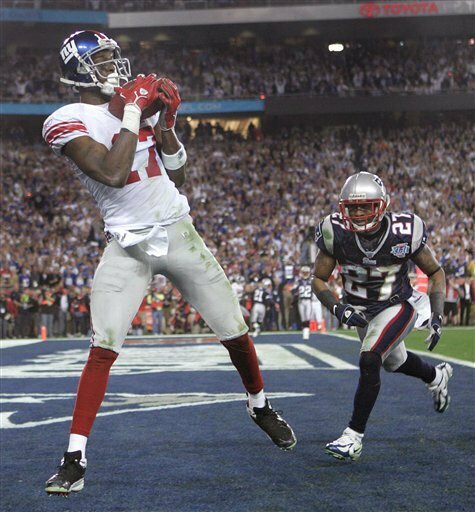 Feb. 3, 2008: then-New York Giants receiver Plaxico Burress, left, catches the game-winning touchdown pass in front of New England Patriots' Ellis Hobbs III during the final minute of Super Bowl XLII. After nearly two years in prison on a gun charge, former New York Giants wide receiver Plaxico Burress was released this morning. Now, the watch is on to see if he plays in the National Football League again. There is, of course, recent precedent to cite. After nearly two years in prison on a conviction related to dog fighting, quarterback Michael Vick, once a star with the Atlanta Falcons, returned to the league in 2009 and to stardom with the Philadelphia Eagles. Burress, though, emerges with the NFL at odds with its players. It's possible that the labor impasse might even mean a scrubbed season. So even if there is interest from teams (and Burress' agent says there will be), it might be some time before any can sign him up. And time isn't working in Burress' favor. He turns 34 in August. Vick is three years younger. Plus, star quarterbacks are harder to find than wide receivers. ESPN.com's NFL Nation blog runs through the league's teams and concludes that the places where Plaxico are mostly likely to play are the Eagles (where he would join Vick) and the New York Jets.